Find out what benefits an enterprise architecture management tool has vs excel, powerpoint and visio. The value of using a professional Enterprise Architecture solution and evidence that professional solutions are worth the price. Software and hardware projects account for a significant portion of the annual IT spend - 31% and 37% respectively. As innovative enterprises are continually searching for ways to cut costs, business leaders will often opt for using a cheaper yet unfit tool over professional solutions. While it may be tempting to start out with what appears to be less costly, these solutions will cost your company more in the long run. Excel, PowerPoint, Visio, etc.,are not specialized enough to produce professional Enterprise Architecture support or end results. 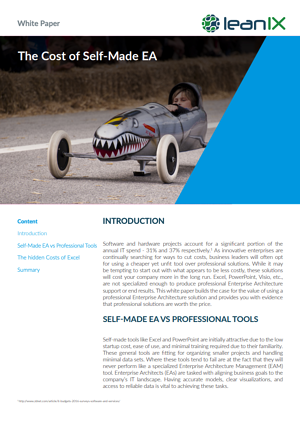 This white paper builds the case for the value of using a professional Enterprise Architecture solution, and provides you with evidence that professional solutions are worth the price.